At Atticus Business Accountants our advice is about people. We handcraft our accounting and tax strategies to achieve the best for our clients year after year. That means our advice is never the same twice. Take Lachlan and Megan, and Bob and Julie as an example. These two couples both run plumbing businesses. Lachlan and Megan are in their 30s with two young children, mortgage on their home, a business overdraft and a desire to upgrade to a larger house in a few years. They aim to grow the business, buy new equipment and put on some employees, however cash flow is a problem. Their main priority for the next few years is their young children’s education. Bob and Julie are in their 50s with one child in university and one in year 12. They’re planning to retire in seven years and want to ensure they travel at least six weeks a year in retirement. Bob is skilling up employees to buy in to the business within the next five years. They’ve just sold their business premises and have purchased a larger one – this was funded through their SMSF and borrowings. These two plumbing companies are both turning over $500k a year, however taking into account their stages in life and their individual priorities, the strategies for managing their finances are completely different. Bob and Julie’s tax is focused on debt reduction and maxing out their contributions to super. We discuss the need to pay a bit more tax now in order to simplify things later as they move into retirement. Over the past 12 months we’ve talked about potential capital gains tax consequences of selling the business, and the best way to skill up employees to take on the business, as well as preparing the business for sale. Lachlan and Megan don’t have the cashflow to be maxing out super and at this stage of their life it’s important to be putting money aside in an investment account for their children’s education. From a tax planning point of view, we look at prepaying lease payments, purchasing plant and equipment tax effectively, prepaying business expenses and managing their cashflow. We tailor their distributions to access Family Tax Benefit or Childcare Benefits through Centrelink. And we carefully look at asset protection to ensure that if something goes wrong with the business their personal assets aren’t at risk. Two businesses, two different approaches and a result that works for our clients. 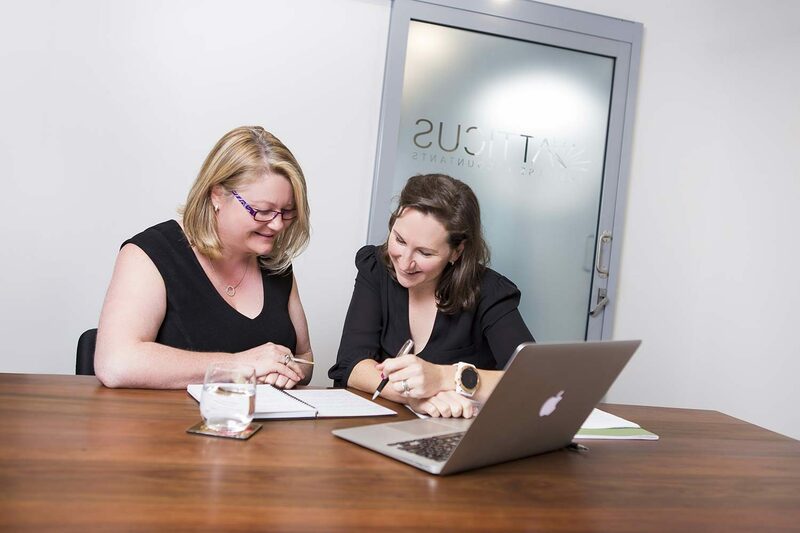 If you want to learn more about how our team will treat you and your individual needs with care and personalised attention please contact us at info@atticusaccountants.com.au or call our office on 07 4642 5800. Please note names and details have been changed to protect client privacy. This is for informational purposes only and does not constitute advice. Information contained on our website has been prepared without taking into account your individual objectives, financial situation or needs. As such, you should consider its appropriateness before acting on this information with regards to your own objectives, financial situation or needs. All transactions are processed in Australian Dollars (AUD$) unless otherwise specified.